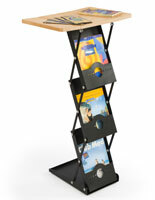 With its multiuse design, this collapsible magazine counter is more than just a literature rack. 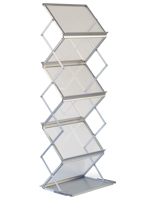 At 40” tall, this display is the perfect height for use as a workstation, podium, or to showcase promotional materials. 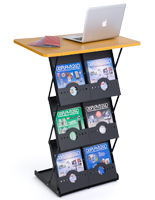 This floor standing magazine counter can also be used as a sign-in or information station at trade shows and conventions. 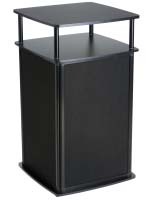 With its accordion-style design, this display quickly folds into its compact carrying case for easy transport between venues. Each case is lockable and comes with two keys. 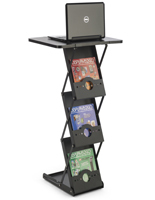 To assemble, simply lock the rack into place for a floor standing item that can hold up to 33 lbs. 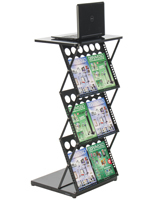 With its six literature pockets and double-wide tabletop, this magazine counter is a versatile display piece that assists you in keeping your trade show booth looking updated and streamlined. 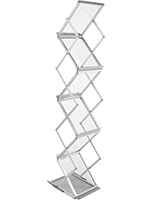 28.0" x 39.5" x 17.5"
19.0" x 7.0" x 18.0"
8.8" x 14.5" x 1.4"
19.0" x 9.0" x 22.5"
This piece is exactly what my team was looking for. We look forward to multiple use options. The only "con" I can consider sharing is that the case (which is VERY sturdy/durable) is not on rollers and is heavy to carry - we are using a small cart to help with transport when needed. Thank you so much for the great review, Monica! We're so happy that this portable counter was exactly what you were looking for, and we appreciate you sharing your feedback about the case. We'll certainly forward your thoughts along to our product development team for review. 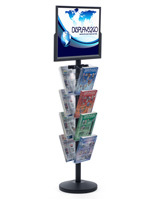 We hope you'll continue to turn to Displays2go for your trade show display needs! Very compact and somewhat easy to use. The only drawback is it's maneuverability....given the size of the unit once closed it becomes heavy. 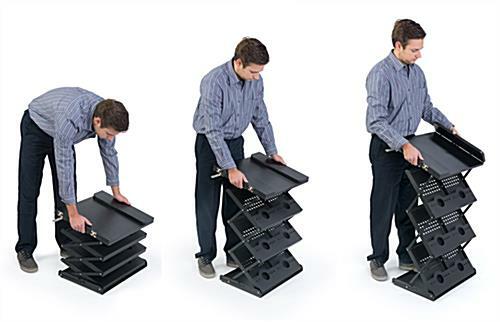 Perhaps mounting small wheels on the bottom similar to mobile luggage with an extendable handle may benefit. Hi John! Thank you so much for taking the time to share your feedback! 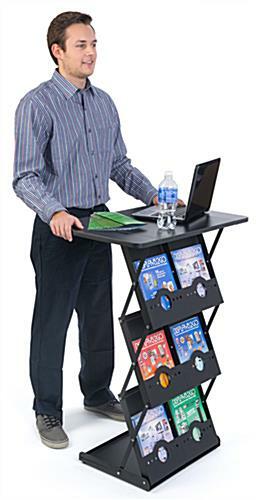 We're glad that you found this portable counter to be compact and easy to use, and we appreciate you sharing your recommendation for small wheels on the bottom. We'll certainly forward this along to our product development team for review. Thank you again! Thanks for the review, Doug! 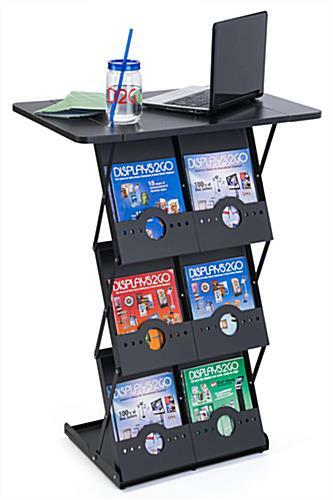 This portable counter is awesome for displaying your literature at trade shows. Please let us know if there is anything that could be improved about this product; we tremendously value our customers' feedback. A great show stand that instantly saved us money and arrived very quickly! That's what we like to hear, Daniel! Thanks for shopping with us. 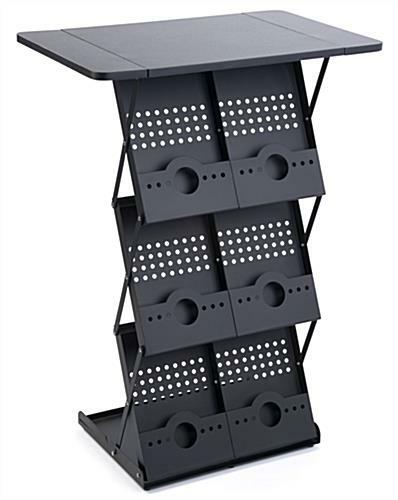 This was a good choice for our trade shows because we had enough room to put our giveaways on the tabletop and room enough for all our literature. 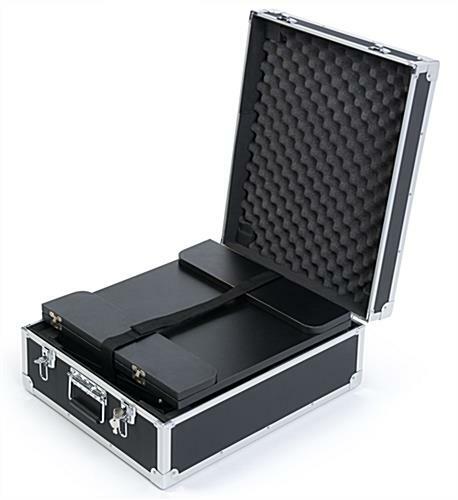 It folds down into a very nice compact flight case that is included. The only issue was that one of the tabletop panels that folds down had holes that were stripped but we found a way to attach it temporarily and when I reported it to displays2go, the customer service person (who was very nice and accommodating) arranged to have a replacement part shipped to us the same day. All our other pieces were perfect. So much better than renting expensive booth furniture at a trade show...and now we own ours! Your booth looks great, Michael! Thanks so much for sharing this photo and taking the time to review! We hope you shop with us again soon.